Cockroaches are distinguished by their long whip-like antennae, flat oval bodies and rapid, jerky walk. Adult German Cockroaches are light yellowy/brown and range in size from 10 to 15mm long. 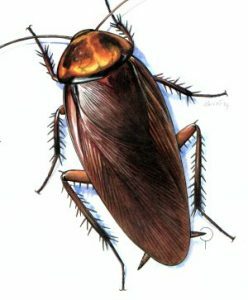 The Oriental Cockroach is a dark brown/black and is 20 to 24mm long. Nymphs, the immature stages of development look exactly the same as the adults, only smaller. Cockroaches in the winter will be active near a source of heat as they will rarely travel outside. They will thrive around heating ducts and in boiler rooms of large centrally heated buildings like hospitals, hotels and restaurant kitchens, and blocks of flats. They will cluster around pipes, stoves, sinks, fridges and washing machines near the motors. In colder months cockroaches can remain active but will not thrive. They will eat anything. This can include rubbish, faecal matter and food left out or the crumbs of food. They also require water and will be generally found in inaccessible harbourages, close to water and food. These places can include inside fridges, fridge motors constantly give off heat, cookers, boilers and washing machines. The infestation will have been baited using a bait called Advion Cockroach Gel Bait which contains Indoxacarb, or treated with one of the following insecticide sprays: Effect Microtech CS which contains Lambdacyhalothrin, Ficam W which contains 80% Bendiocarb w/w or K-Othrine which contains Deltamethrin. Or a powder might be used called Ficam D. This contains an insecticide in a dust formulation @ 1% w/w Bendiocarb. All insecticides are biodegradable, almost odourless and do not corrode or stain. In some instances, like heavy infestations, or those coming from neighbouring properties, or surfaces that have not been cleaned. Then more than one spray or bait treatment will be needed for complete control. In some cases it may be necessary to spray or bait on a monthly basis until the infestation is eradicated, especially so in shared, communal or multi-occupancy buildings. Call us on 0330 100 2811 to book an appointment regarding cockroaches in the winter or any other pest problem you may have.